The application of Liquid Fence® Goose Repellent (Concentrate Ready-to-Spray) makes the food supply in the application area very undesirable to geese, turkeys and ducks. The elimination of the food source will change the feeding habits of these birds and cause them to look for a more desirable feeding location. Make sure the control knob is in the off position. Attach and hand tighten water-hose to nozzle. Turn water on at faucet, and aim nozzle toward area you wish to protect. Remove safety tab from nozzle by pressing towards control knob, snapping it off. Turn the control knob to the ON position to begin spraying. 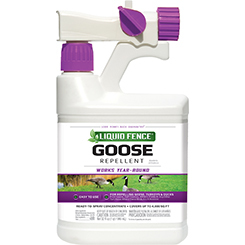 Apply Liquid Fence® Goose Repellent liberally to lawns or turf areas during a dry period. When finished, turn the control knob to the off position. Turn faucet to off position. Discharge residual water pressure by turning control knob to water position and then off again. If you desire to spray water only, turn the control knob to the water position, to bypass the product.